Latest NAM supports the GFS and still has a significant freezing rain event for Wednesday night into Thursday morning. Sat 3/4: Mostly sunny. High near 40. Sun 3/5: Partly sunny. High 42. This afternoon's GFS still shows a freezing rain possibility for much of Thursday morning. Cold air at the surface is expected to hang tight, as warm air aloft causes sleet and rain. While temperatures are expected to go above freezing on Thursday, it may not occur before a hazardous commute on Thursday morning. I'll continue to monitor this situation. Philadelphia Weather Update- Freezing Rain Thurs Morning? Low pressure is expected to approach from the west late Wednesday night. Precipitation in the form of sleet and rain will start before daybreak on Thursday, when temperatures, especially in the suburbs, may be below freezing at the surface. Slippery conditions from freezing rain possible Thursday before it changes over to rain. The low pressure system for next Monday has disappeared from today's models. A quiet and generally seasonable week ahead. Some rain expected on Thursday as a low pressure system tracks through. The weekend looks cold but no precipitation expected. The long range shows a possible snow storm next Monday. It's a long ways off, so I expect that to change. Not quite as expected yesterday- minimal clouds, no showers, and the actual front didn't move through until evening. Last night's temps didn't fall as fast as expected and today's temps won't be as cold as originally expected. Some instability may cause flurries. The coming week looks uneventful right now. A gradual warmup with a chance of rain showers on Thursday. The coming weeked currently looks mostly sunny with temps in the upper 40s to near 50. Sun 2/26: Mostly sunny with some clouds at times, and becoming WINDY. Chance of a snow flurry. High 35. The clouds associated with the clipper move in later this morning/early afternoon. (Last night's NAM has considerably less cloudiness than previously expected.) Just a chance of a rain shower later in the afternoon with the frontal passage. Last night's models have it a bit cooler today than previously expected. Sat 2/25: After a sunny start, there'll be an increase in clouds as the day goes forward. Becoming very WINDY in the afternoon. Towards late afternoon, a chance of light rain shower. High near 47, becoming much colder at night. Sun 2/26: Mostly sunny and WINDY. Chance of snow showers. High 35. The models are consistent in keeping the clipper unphased with a southern storm. The latest GFS continues to have any precipitation on Saturday to our north, although the areal coverage has increased from model run to model run. Sat 2/25: Mostly cloudy, but with some breaks of sun possible. Becoming very WINDY in the afternoon. Towards late afternoon, a chance of light rain shower. High near 50, becoming much colder at night. Sun 2/26: A mix of sun and some clouds. WINDY. Chance of snow showers. High 34. Still a great deal of uncertainty with the Saturday forecast, as the clipper system seems to be strengthening and the storm in the SE is a bit further north now. The models still keep these systems separate and unphased, but I'm still not sure of that. Looking at the GFS Ensemble Probability of Predictability, the Saturday time frame has very poor confidence. So we'll keep an eye on things. Sat 2/25: Mostly cloudy, with a chance of light rain changing to light snow towards evening. High 47, becoming much colder in the late afternoon. Much uncertainty continues with this Saturday forecast. Sun 2/26: A mix of sun and some clouds. Windy. Chance of snow showers. High 30. Uncertainty about the Saturday forecast- a clipper type disturbance with a secondary cold front will pass through on Saturday. The GFS has precipitation to a minimum around our area, but the temperature prediction has changed significantly and a larger area of rain will be to our south. The models keep this area of rain separate and unphased with the clipper. We'll have to see. Sat 2/25: Mostly cloudy, chance of a brief snow shower or rain shower. High 45. becoming colder in the late afternoon. Much uncertainty with this Saturday forecast. A weak disturbance will affect us tonight into Thursday. Rain showers possible. Another cold front moves through on Saturday. At this time, the low pressure and its associated cold front is still expected to remain unphased with a storm in the SE, so little precipitation (snow) is expected, if any. In a late February and March-like pattern, the low pressure is expected to be blocked from moving away and will remain and deepen in the Gulph of Maine, created a very strong flow of very cold air and high winds for Sunday and Monday. Areas of spin (vorticity) are expected to rotate around the deep low near Maine and may affect us with snow showers. Exact timing not clear at this time. Still watching to see if this low will phase with a storm in the SE on Saturday night. The models still keep it unphased. Sat 2/25: Mostly cloudy, becoming windy, with a chance of snow showers later in the day. High 37. Sun 2/26: Considerable cloudiness, very WINDY and quite cold. Chance of snow showers. High 32. Basically quiet conditions until the weekend. A weak disturbance will affect us on Thursday. As mentioned yesterday, another disturbance with its cold front will affect us on Saturday. The models keep this unphased with a souther storm at this time. Brief snow showers expected on Saturday with colder temps on Sunday. Still watching to see if this disturbance will phase with a storm in the SE. Sat 2/25: Partly cloudy in the morning. Cloudy in the afternoon with snow showers expected. High 39. Sun 2/26: Mostly sunny, windy and cold. High 35. Current outlook is for a quiet week with moderating temperature. Small disturbances may give us clouds at times. The latest GFS is advertising a very very cold outbreak for next weekend. On Saturday, a secondary cold front accompanying a low pressure clipper has the possibility of phasing with a storm in the southeast, creating a snowstorm for us Saturday night. The model is just hinting at this right now and most models don't currently phase the two systems. Something to keep an eye on. Current outlook is for a quiet week with moderating temperature. Small disturbances may give us clouds at times. A storm, originally expected to affect us on Thursday seems to be suppressed to our south now, doesn't appear as though it will affect us. The latest GFS is advertising a very very cold outbreak for next weekend. Updates during the week. High pressure will bring sunny skies today, but with temperatures below freezing. A mostly quiet week ahead until Wednesday night. Much uncertainty about light snow at that time. A warmup on Thursday and Friday and a return to cold temps next weekend. Sun 2/19: Sunny and very cold. High 30. The models continue to suppress light snow just to our south today, but my analysis of pressure falls and areas of upper vorticity suggest that light snow or flurries is still possible in the Philadelphia area today, as low pressure appears to be developing along Long Island and upper air disturbances (areas of vorticity or spin) appear to be tracking towards us from the west. Either way, a dusting is all that I would expect. The models predict nothing and they're usually right. Very cold air arrives later in the day and is with us through Sunday and much of Monday. Sun 2/19: Sunny and very cold. High 29. Each successive model run has had the light snow from a disturbance to our south just a bit further north. It would not surprise me if we had some light snow shower/ flurries Saturday morning. Skies clear later in the day. Sat 2/18: Cloudy in the morning with a slight chance of snow showers or flurries. Windy. Clearing during the afternon. High 38 with temperatures falling in the afternoon. Sun 2/19: Sunny and cold. High 33. High pressure will build in after a strong cold front passes through on Friday. As mentioned several days ago, a disturbance is expected to pass to our south, suppressed by the high pressure system. 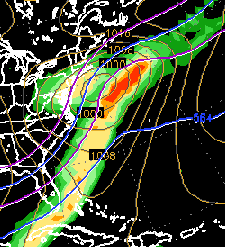 However, last night's NAM and GFS has the track of this low pressure much further north on Saturday. Sat 2/18: Considerable cloudiness through mid-day. Windy. Clearing later in the day. High 38. Sun 2/19: Sunny and cold. High 34. High pressure is expected to build in behind a strong cold front on Saturday and Sunday. Cold temperatures are expected for the weekend. Disturbances still expected to be suppressed to our south. Current outlook is a slight chance of flurries on Monday. Long range has a storm next Thursday, but it's a ways off! Sat 2/18: Partly to mostly sunny. Breezy and cold. High upper 30s to near 40. Low pressure systems are currently expected to be suppressed to our south, but these will have to be watched, since a slightly more northern track may introduce light snow to our area. Sun 2/19: Sunny and cold. High 35. No Change with the upcoming forecast. This week has a considerable warm-up for Wed through Friday. A cold front and storm will move east on Friday. Most of the energy will shear to our north, but will bring a chance of showers during the day on Friday.. Weekend Outlook: Sunny windy and cold on Saturday and Sunday. Less wind on Sunday. Highs in the mid to upper 30s both days. Upcoming week has a warm-up for Wed through Friday. A cold front and storm will move east on Friday night, bring rain late and possible snow showers Saturday morning. Weekend Outlook: Clearing windy and cold on Saturday. Partly cloudy on Sunday. Highs in the 30s both days. The storm is departing and should be over in an hour or two in Philadelphia, later in NJ. In summary, the original 1.00 inch water prediction was close enough, with varying amounts oflocal enhancement, and in NJ, diminished accumulation due to higher temps and less focused lift. The NWS issues a statement about snow totals around our area. Today will have slow clearing, windy and cold conditions. High 28. For the upcoming week, cold temperatures early in the week will lead to a warm up on Thursday and Friday. Another cold front with rain changing to light snow will move through Friday. Cold temperatures will return for next weekend. The 1 AM NAM model has doubled the amount of snow remaining after 7AM to another 2-3 inches. Currently, just west of Philadelphia, frontogenic forcing and upsloaping from terrain is causing localized banding and 'thunder snow' has further increased localized amounts, much as thunderstorms can increase local amounts in the summer. Areas in Chester, Delaware and central Montco counties have experienced heavy banding with these mesoscale (small scale) features. The models aren't great at pin pointing where these features will happen, but do hint at their occuring. I believe it was originally expected to occur in central NJ. It looks like we are ending up here (Chestnut Hill vicinity) with over 1 foot of snow, possibly as much as 15 inches. Areas in the city probably will end up with 1 foot or somewhat less. Snow is still expected to taper off by late morning, with slow clearing. Snow flurries and high winds, above 25 mph, are expected as the storm departs. The new NAM and GFS model data has become available. Both models have raised the QPF again during the 1AM-7AM time frame, from 0.30 to 0.50 inches water. Storm totals are close to .90 inches water again for both models. Temperatures remain somewhat around freezing (32.5 here) and the water to snow ratio for much of the snowfall has been 1:10 or less so far. That ratio will increase from 1 AM to 7AM as temperatures drop into the low 20s. Winds are expected to be intense by morning. There are also areas of increased precipitation, localized, just to our west due to localized increased lift("frontogenic forcing"). Some areas will have increased amounts of snow, especially Chester county and areas of central NJ. For Philadelphia, my best guess at this time is now 7-9 inches by mid morning, when most of the snow will be ending. At this point, exact storm totals are academic-- We're NOT talking about a surprise 20 inch snowfall, nor are we talking about a 4 inch fizzler. Winter Storm Update- 5 PM Update- Lowering Snow Totals! I've looked at the 1PM NAM and GFS data. It seems I'm going to have to lower my snow totals prediction. The QPF values have declined to 0.70 inches water on both the NAM and GFS models. Additionally, temperatures at the surface are higher than I had expected at this time and the amount of dynamic cooling hasn't offset the milder than expected NE flow. The latest models show the temperature not going below 32 until 7 or 8 PM in Philadelphia, so some accumulation will be lost. With a much wetter snow, the ratio here will likely be 1:10 instead of 1:15. The best guess at this time is now 6-8 inches. The newer model runs will be out this evening between 9:45 and 10:45 and I'll update before 11 PM. The GFS just became available and the NAM and GFS very similar at this time. QPF values for the GFS approach 0.93 inches with similar time frames as the NAM model. With this model run, the NAM which had been half the predicted amount, now exceeds the GFS. Based on a water ratio of 1:15, I'm predicting 12-14 inches of snow for Philadelphia when all is said and done Sunday morning. More snow in NJ. Sat 2/11: Cloudy during much of the day, snow starting mid to late afternoon. About an inch by 6 PM. High 37. Sun 2/12: Snow tapering off towards noon, then cloudy windy and cold. High 28. Total accumulations as per discussion above. Updates, as necessary, later. Next model runs of any great significance will be later this evening. I'll update tonight. Winter Weather Update- 9 AM Sat- NAM has higher snow totals! This morning's NAM data just became available. Total QPF value has increased to 1.05 inches water. Temps below freezing will result in snow totals in excess of 14 inches for Philadelphia. This morning's NAM has fallen directly in line with last night's GFS model. Some light snow starting early to mid afternoon. Only an inch possible before 7 PM. HEAVY snow tonight into Sunday morning. Total snow about 14+ inches. I'll update with the new GFS data that will become available about 10:45 AM. The 1AM reruns of the NAM and GFS models had remarkably similar results. QPF values of 0.78 and 1.01 inches of water respectively. The NOGAPS depiction is the graphic on the left. With much of the precipitation arriving with colder temperatures at night, I'm raising the ratio of snow to water from 1:12 to 1:17. This would give us a snowfall of 12-14 inches in the immediate Philadelphia area, with up to 18 inches in parts of NJ. There are still differences in the start time for the snow. The GFS has about 1-2 inches before nightfall, the NAM has virtually nothing starting until about 5 or 6 PM. We'll have to see about that. Sometimes, the warm advection before a storm occurs earlier than the models show. Othertimes, the air is so dry that little snow hits the ground, evaporating for several hours aloft. Sat 2/11: Cloudy during much of the day, snow starting mid to late afternoon. A coating to an inch by 6 PM. High 30. The next NAM model output will be available between 9:30 and 10; the 24 hour products of the GFS might be available as early as 10:30 this morning. I'll update later. The latest GFS data just rolled in. Total QPF = .93 inches water or about 10-13 inches snow. The GFS has snow starting earlier than the NAM, with some snow possible by mid afternoon, heavy at night and ending around noon on Sunday. At this point, we'll average the GFS and NAM which would give Philadelphia 9-11 inches of snow by noon on Sunday. The next model run that we can hang our hats on will be available later Saturday morning. The very latest NAM data just became available. For the gridpoint of NE Philadelphia Airport, the QPF= 0.73 inches water or about 9-10 inches of snow for Philadelphia. Areas to the east, in NJ, have much higher amounts, over 12 inches. The snow doesn't start until 5-7 PM on Saturday. Most of the day is cloudy and dry. The snow doesn't end until late morning or noon on Sunday. The more accurate GFS model data will become available about 10:45 PM tonight (My source of GFS data has not been reliable lately.) I'll update around that time.